If you were to tell people that you were headed to Chembur in Mumbai for a Sindhi breakfast, then everyone would tell you to go to VIG Refreshment for the dal pakwan, and they wouldn't be wrong in their recommendation. The dal pakwan at VIG, as I found out during a recent trip to Chembur, is indeed superb. The combination of the deep and robustly fried crunchy maida (refined-flour) disc, or the pakwan, with the subtly flavoured channa (Bengal gram) dal and sliced raw red onions and the watery but zestful green chutney (made with ground green chillies, mint and coriander leaves, lime juice at its core and there could me more additions too), indeed made for a legendary 'breakfast of champions.' The dish is heavy and you can't eat this everyday though, especially if you are someone like me who doesn't lead a physically active life and is wedded to his desk and who last sprinted in 1999 while trying to catch a Mumbai local while running late to office. Who are the Sindhis you ask? They are a community of people who originally belonged to Sindh in what is now modern Pakistan, and of which Karachi is the capital. Many displaced Sindhis migrated to India during the partition. Some came by train and landed at Delhi. Others by ship, especially the women, as travelling by trains or by road was not considered safe in those disturbed times. The ships landed at Mumbai. Many of these immigrants settled at places in Mumbai such as Ulhasnagar (in the outskirts), Chembur and Khar as they had relatives residing there. Most had lost their all when they became refugees, but through the dint of their hard work and enterprise and positive spirit, most had managed to turn poison into medicine and are now leading members of their communities wherever they live, in Mumbai and across the world. Many of the eateries in Chembur, some of which I went to that morning, were set up when India became independent, by Sindhis who had just moved in. You would possibly see this story replayed at Ulhasnagar too. A story that reminded me of Salman Rushdie's book, Midnight's Children, where the protagonists were born at the time when India became independent. The Sindhi food that I ate at Chembur that day was delicious but very very heavy. I had to skip lunch and just made myself some curd rice to nibble on instead when I returned home. 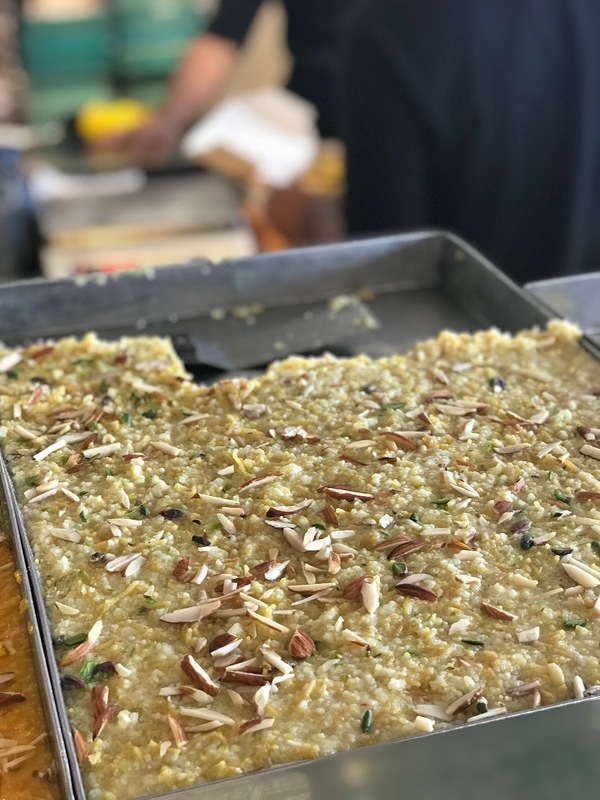 Turned out that this energy packed carb ridden breakfast existed to fuel the hardworking life that the Sindhis lead when they had to start life from scratch as I realised when I spoke to advocate and solicitor, Kanchan Pamnani, who is Sindhi and is herself one of life's fighters and who has challenged visual impairment to rise in her profession. Kanchan told me that the Sindhis of yore would have a heavy breakfast and then set off for work. The heavy breakfast would keep them going while they slogged through the day, often traversing long distances. Lunch for the industrious Sindhis navigating the brave new world, would be a light khichdi and dahi at the most. Papad and whiskey, followed by dinner, would be their way of ending a hard day's work. I could sense Kanchan break into a smile as we chatted on the phone about my Chembur adventures. She told me that she is a South Mumbai Sindhi who would be pampered when she'd go to her nanny's (granny's house) in Chembur as a kid. Shen also told me that she would love to take her mom to Chembur to relive those memories someday over some nice chaat there, but the uneven pavements and trafficked roads scare them both. I had been planning this trip to Chembur to try out the Sindhi food for the past three years but things just didn't work out and I couldn't make it all this while till last weekend when I finally did so. I couldn't have asked for better company that day as I was with Alka Keswani, the author of the award winning blog, Sindhi Rasoi, and who is now a family friend too. I call her my Sindhi Food Oracle and reach out to her whenever I am writing anything about Sindhi food. Alka had most kindly agreed to come over to Chembur and show me around some of the food places there. After much debate and discussion, we decided to focus on the breakfast places first. What followed that morning was a smorgasbord of personal memories that flavoured our morning, what the magic of oral history is all about. Alka had grown up at Ulhasnagar which is at the outskirts of Mumbai, a place that is considered to be the hub for the city's Sindhi community. Like Kanchan's, Alka's grandparents too used to live at the Sindhi Camp area of Chembur and, like I did too as a kid in Kolkata, Alka too spent all her school holidays with her grandparents. At her grandparents, young Alka was surrounded by her cousins who she grew up with and by doting uncles and aunts. Alka relived memories of the fun times that she had at her grandparents house as showed me around Chembur. Like most Indian joint families of yore, Alka's family too has moved out to different parts of the city today. While we walked around Chembur, I noticed Alka take pictures on her mobile and excitedly WhatsApp the same to her cousins. The owners of VIG Refreshment are not Sindhi though as I found out that morning. They are Punjabi migrants whose history mirrors that of the Sindhis. It traces its origins to the late Sevaram Banjuram Panjabi Arora, who had come to Mumbai by ship from Pakistan during the Partition. He was a caterer while in Pakistan, from what I understand, and opened a shop selling sweets and some savoury dishes at the same spot where VIG stands today. That shop had no name. I got this story from Mr Arjun Dev Arora, the current owner of VIG, who was sitting at the shop counter smiling genially at all who came in. Arjunji was born in India but his parents had come to India from Pakistan. They had come to India by train and hence went to Delhi and not Mumbai. Arjun married Sevaram's daughter and moved into Mumbai in the early 1970s and now runs the shop. When he took over the running of the place, Arjun Arora named the 'shop with no name', VIG Refreshments in 1974. Why VIG? After VIG Puriwala, he told me. VIG puriwala was a puri shop in Delhi's Lal Kela Lajpat Rai market it seems and it was Arjun's favourite restaurant while he was growing up in Delhi. It was his dream to open an eatery someday and name it VIG and so he did. He has obviously done justice to his late father in law's legacy as was evident in what I ate that morning. When I was talking to Arjunji, an elderly gentleman named Ashish Kumar Bhasin, who was dressed in white, came up to me and told me that he's been coming to the shop for 70 years, from before Arjun's time he said, and emphasised that the food still tastes the same. He told me that his brother was a film actor, known as 'Coca Cola' in the industry. As Mr Ashish spoke proudly of the chhole at VIG, I had visions of doing the same in my favourite hangout, Candies, years later. 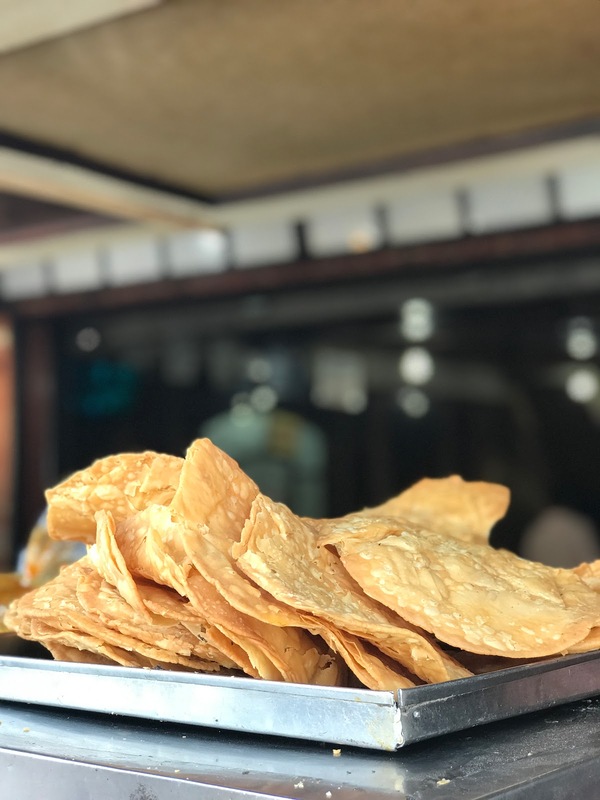 In the heydays of the RK Film Studio I am told, the Kapoors, often referred to as the 'first family of Bollywood', had made Chembur the eating out hub of Mumbai. The legendary Raj Kapoor would often pull up his car outside places such as VIG or Jhama Sweets next door, and would stock up with the dal pakwans and chaats. Street lore says that so does Salman Khan today when heading to his farm house but don't hold me to the facts on that. The Bachchans are said to be fans of the Jhama gulab jamuns too. 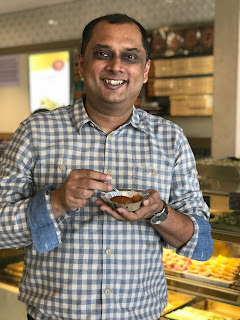 Alka had once taught me, while I was writing an article on dal pakwan, that the trick is to eat all components of the dish at one bite - the pakwan, the dal, the chutney and the channa. This time she introduced me to another Sindhi favourite, the pattice or what is known as 'chaap' in the community. It is a popular snack which, you get served with chhole, at VIG in the mornings too. This, like the dal pakwan, can kickstart your day on turbo mode. I wasn't keen to order the chhole pattice at VIG. I am not a fan of the ragda pattice of Mumbai you see. The doughy potato croquettes and the lifeless white pea curry of the dish put me off and I thought that the Sindhi pattice would be same. Well it turned out the that Sindhi pattice was nothing like the pattice of the ragda pattice. It was more a cousin of the Alu Tikki of the north in terms of similarities. The pattice at VIG consisted of a thin and crunchy breadcrumb layer which covered a soft and well seasoned potato mash, inside which was encased a core of lightly spiced channa dal. The combination was heady and the pattice was served with the Punjabi chhole of kulcha and bhaturas and raw onion and green chutney, and was one of the two revelations of the morning for me. The other was the dal moong sandwich but more on that in a bit. Update 13/11: One of my readers on the Finely Chopped by Kalyan Karmakar page on Facebook gave some lovely perspective on VIG which I thought must add here. His name is Arjun Kaumar Pamnani. He said that he remembers VIG from a time when it was not VIG. When Mr Sevaram, who had aged by then, would sit in the corner, wearing a lungi, and fry chaaps (pattice). He apparently had a couple of lights on top of the shop. Green meant chops and cutlets were there. Red meant it was over. ' No need to ask,' as Arjun put it. Sevaram was a man of few words it seems unlike his son in law and was just known as 'chaapwaala'. While everyone will tell you about VIG, getting to know about the 'dal moong sandwich' was the advantage of going to Chembur with someone like Alka. The dal moong sandwich that she got me to try is available in a cart in a lane down Sattu Sweets which is close to Jhama and VIG. The cart is run by young Jitendra Jarkani who was at the cart himself, along with his staff, feeding hungry customers. Jitendra told me that he had taken over the mantle of running the cart from his father, the late Harish Jarkani, and who had in turn inherited it from hi s father (Jitendra's grandpa), the late Bhojraj Jharkani. Mr Bhojraj had come to Mumbai 70 years back at the time of Independence and had set up this stall. He cooked and sold the dal back then. His son cooked after him. Now that they are both no more, his daughter in law, Jitendra's mom, cooks. Jitendra promised me that he will cook for the stall one one day too. What is dal moong? It's a Sindhi favourite dish from what I figured out, which you also get at temples as Prasad apart from at carts on the street. Simply put, they make a sandwich with a mix of dals and pav. Three types of dals (lentils) - green moong, channa (Bengal gram) and yellow split pea - as Alka explained to me - are slow cooked separately in vessels called 'sipri'. Three sipris were placed on the cart at Jitendra's. The dals were almost over by the time I reached at 11 and Alka had literally tried to keep the shop open till I reached. The three dals are mixed together, when orders are placed, and then put into a sliced pav along with the ubiquitous green chutney and raw sliced onion. I found the combination to be heady and it turned out to be such a wonderful welcome to Chembur given that this was my first stop that morning. For those who don't want carbs, you can have just the dal moong too. A plate of dal costs Rs 20 at this street side cart which has no name, and the dal sandwich, Rs 10. Some have the dal with koki, the traditional Sindhi parathas, as Alka told me. She had most kindly made some for me in the morning to try with the dal. 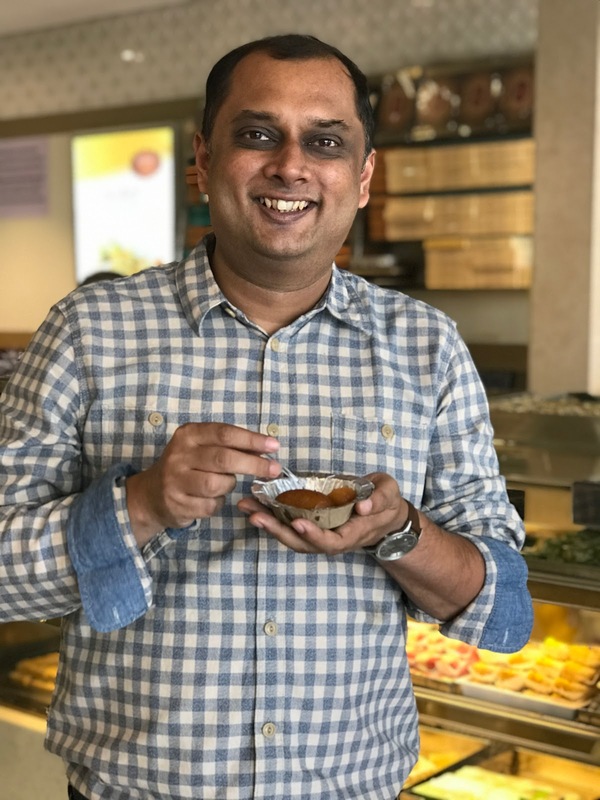 I later learnt through Facebook comments that there are other dal moong sellers in Chembur and in Ulhasnagar too but everyone, including Pravin Arora, the son of Arjun Arora of VIG, wrote in saying Jitendra's was the best. Update 13/11: As for me, the dal sandwich reminded me a bit of the ghoogni pauruti combination of Bengal, possibly because of the combination of the turmeric favoured split peas and channa dal with the soft bread and the dish seemed to bring the west and east of India together for me on a plate. I also want to share the memories of Mr Kishore Punjabi who had commented on my Facebook page on seeing the video I shot here. This is from forty years back in the early 1970. Mr Punjabi used to go to the stall during recess at school. Jitendra's grandfather was around then and was affectionately called Bhojo by his customers just as Jeetndra is called Jeetu. He used to set up the stall outside the Sind Cosmopolitan High School, also known, as Matta School. The dal moong sandwich, which costs Rs 10 (1000 p) today (2017) costs 10 p then! I was most tickled when a fellow Soka Buddhist friend of mine, Soma, recently introduced me to a friend of her's as a 'happy food blogger', as that is what I strive to be. Well, talking of 'happy food', it turned out that our last stop that morning actually specialised in that, happy food. 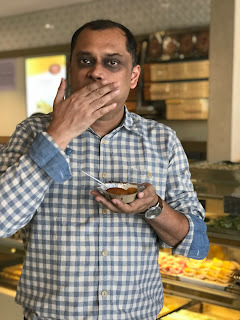 I am talking of Jhama Sweets, set up by the late Jhamalal Lulla, again just after independence when he came into Mumbai, and at this very spot. The business is run by his descendants now. From its humble beginning at this very spot, Jhama has grown to have many branches as Mr Neresh (or Naresh), who has worked here for more than two decades with the family. The shop at Chembur got its air-conditioned avatar a couple of years back and it reminded me of the sweet shops of Delhi. What's the connection with 'Happy Food' you ask? Well, according to Neresh, folks from the nearby ONGC and Barc offices, which employ thousands of people keep coming to Jhama to buy sweets to distribute during happy occasions such as weddings, promotions, the birth of children in the family and so on. "So you are a part of all their happy occasions," I concluded with a smile. "You could say so," said Naresh politely while attending to a sea of customers at the cash desk. Alka got me to taste the hot and juicy gulab jamuns at Jhama and the sev barfi at Jhama. The sev barfi is a unique combination of khoya (reduced milk), sugar and salty sev namkeen. Sweet tastes dominated it though and you could barely taste the sev. These sweets, along with Karachi halwa, were the original repertoire of Mr Jhamalal from what I gathered. The shop now has hundreds of varieties of sweets, namkeens and chaats too. The gulab jamuns are of the oblong variety which I first saw in the Amul gulab jamun cans years back. When I put up this post, some of my Bengali friends commented on its similarity with a sweet called ledikini from Kolkata. The sweet was said to be named after Lady Canning, the British Governor General's wife. Ingredients such as chhana (cottage cheese), khoya (reduced milk), maida are used in differing proportions in each. Alka introduced me to a sweet called Tosha. These are apparently given by Sindhi families when someone in the family has died of ripe old age. Around eighty upwards is the loose definition of 'old age". Alka also got me to taste a unique combination of salty sev and boondi. Apparently this, and papad, was served in Sindhi homes when guests dropped in unannounced. I truly felt like a 'happy food blogger' that morning and I felt most grateful about that. As far as Chembur is concerned, the trip whetted my appetite to come back here for lots more that I have yet to discover and to be a tourist in my city once again. Have you tried some of the Sindhi food at Chembur? If so, what are your favourites? Please write in and let me know.